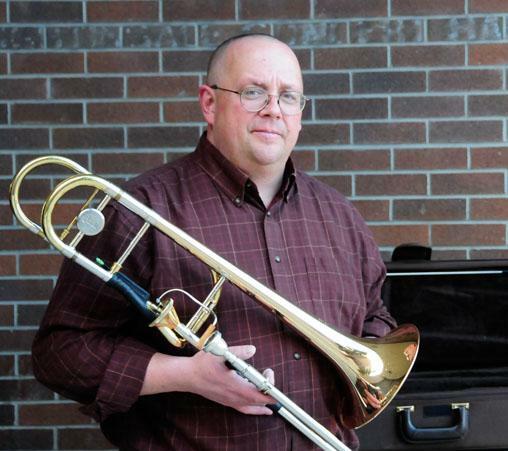 Appointed Principal Trombone with the Reno Philharmonic Orchestra in 2005, after serving as 2 nd Trombone from 1991 through 2004. Currently serving as Principal Trombone with the Reno Chamber Orchestra. Freelance trombonist n the Reno/Tahoe area, including showroom work, Broadway touring companies, as well as other orchestral jobbing. Served as Principal Trombone with the National Symphony Orchestra of Ukraine for their 2017 North American Tour. Plays trombone with the Great Basin Brass (2015 release of CD recording “Through A Different Lenz”). Other recording credits include featured solo work with the Reno Jazz Orchestra, Cami Thompson, and the Brian Landrus Project. Also, lead and section work with the Pete Petersen's Jazz Collection as well as various freelance recording work in the Dallas, TX, Miami, FL, and Reno, NV areas. Primary employment is as an educator in the Washoe County School District in Reno, NV (1991-present). Served as adjunct faculty for the Jazz and Applied Trombone departments of the University of Nevada, Reno School of the arts from 1991-2005, and again from 2008-2010. He earned a Bachelor of Music from North Texas State University (1984) and a Masters of Music in Jazz Pedagogy from University of Miami, Coral Gables (1989). Reno Jazz Orchestra: Jazz Alive!